"I have attended many EB-5 conferences. 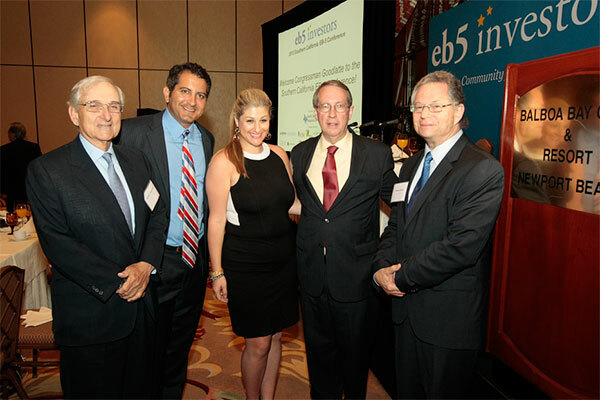 The Southern California EB-5 Conference sponsored by EB5 Investors magazine was the best one-day event I have attended in years. The combination of regional centers, immigration, corporate and securities lawyers, economists, and developers was remarkable. Having Bob Goodlatte, Chair of the House Judiciary Committee speak, was icing on the cake." Thank you to all sponsors, speakers, and attendees of the Second Annual Southern California EB-5 Conference. Back again at the beautiful Balboa Bay Club & Resort in sunny Newport, California, this year's conference once again drew the House Judiciary Chairman as well as the most prominent EB-5 experts, stakeholders, and industry leaders for a truly valuable information packed day. The conference kicked off with breakfast and a Q&A session by keynote speaker U.S. Congressman Bob Goodlatte (R-Virginia), Chairman of the House Judiciary, regarding legislative oversight over the EB-5 Immigrant Investor Program. Congressman Goodlatte addressed the Senate immigration bill as well as several important EB-5 issues. All stakeholders in attendance were encouraged by the support Congressman Goodlatte voiced for the EB-5 Investor Visa Program, as well as the numerous expert panels held throughout the day. Also in attendance was Congressman Dana Rohrabacher (R-California). After the Q&A session with Congressman Goodlatte, the Conference broke up into panels led by several groups of experienced EB-5 professionals. The conference's programs offered simultaneous beginner and advanced panels to accommodate the wide variety of attendees which included EB-5 industry newcomers as well as veterans of the program. The first panel for the day, Understanding EB-5, was moderated by conference co-chair Kate Kalmykov, of Greenberg Traurig, LLP and included panelists Barnard Wolfsdorf of Wolfsdorf Immigration Law Group, Linda Lau of Global Law Group and Jeff Campion of Texas Urban Triangle Regional Center. The panelists gave a succinct overview of the EB-5 program with attention to detail including Regional Centers and precedent EB-5 cases. Dawn Lurie of Sheppard Mullin led the panel Understanding the Interplay of USCIS EB-5 Requirements and SEC Regulations joined by speakers Genna Garver and Steve Anapoell of Greenberg Traurig, Michael Homeier of Homeier & Law, P.C. and John Tishler of Sheppard Mullin. The panel covered various USCIS requirements of the EB-5 visa program, the ways in which they must be addressed in light of SEC regulations and enlisting the assistance of proper legal counsel to maintain SEC compliance of offerings. On Panel 3, conference co-chair David Hirson of Fragomen, Del Ray, Bernsen and Loewy, LLP led a discussion on Understanding the Regional Center Designation Process joined by Jor Law of Homeier & Law, P.C., Scott Barnhart of Barnhart Economic Services LLC and Osvaldo Torres of Torres Law, P.A.. The panelists extensively discussed the I-924 Regional Center Designation process and USCIS RFEs. Attorney Kate Kalmykov of Greenberg Traurig along with Brian Su of Artisan Business Group, Howard Wu of CanAchieve Immigration Consultants, Reid Thomas of NES Financial and Cheryl Lane of Chrysalis Capital Group LLC concurrently discussed Raising Funds: Effective EB-5 Marketing & Investor Confidence in EB-5 Projects. The group shared strategies for approaching and securing potential investors and emphasized the need for businesses to understand cultural differences when working with EB-5 foreign investors. Lunch featured an address by guest speaker Austin Fragomen, Jr., respected and accomplished immigration attorney and partner of the world's largest immigration law firm. We were lucky to have such an incredibly experienced individual to address current issues of ongoing comprehensive immigration reform. The panels resumed after lunch with a discussion of Alternative Funding Sources & EB-5's Role in the Capital Stack moderated by Conference host Ali Jahangiri, president of EB5 Investors Magazine and EB5Investors.com. Joining him were Dan Healy of Civitas Capital Group, George Ekins of American Dream Fund, Inc, Paul Fuhrman of Colony Capital, LLC and Steven Shelley of North Texas EB-5 Regional Center. The panelists discussed how bridge and mezzanine financing have been used in EB-5 projects as well as the general structuring of deals with EB-5 capital. Attorney Jennifer Hermansky of Greenberg Traurig led a discussion on EB-5 Regional Center Project Planning: From "A" to "I-829" with speakers Henry Liebman of American Life, Inc, Al Rattan of USA Continental Regional Center, James Taylor of Omega Regional Centers and Alireza Mahdavi of American Logistics International Regional Center. The panel covered issues such as selecting a good business project and team, as well as job creation tracking and SEC regulations. Host Ali Jahangiri of EB-5 Investors Magazine and EB5Investors.com also led the panel EB-5 Capital: The Lending Model to Developers featuring speakers Chuck Leamy of Jay Peak Resort, Inc, Pat Hogan of CMB Regional Centers and George Ekins of American Dream Fund, Inc. The group discussed the ways in which Regional Centers connect and operate with real estate developers to fund projects and the importance of job creation to foreign investors, Regional Centers, and project developers alike. Dawn Lurie of Sheppard Mullin moderated the discussion of Best Practices for Investor Filings, a panel including speakers David Hirson of Fragomen, Del Rey, Bernsen and Lowey, LLP, Jennifer Hermansky of Greenberg Traurig, LLP, Mark Ivener of Ivener & Fullmer LLP and Angel Brunner of DC Regional Center. They tackled issues such as the ways in which EB-5 legal teams must perform due diligence and quality control in order to avoid RFEs at the I-526 and I-829 stages. The conference discussion panels wrapped up with the panel Overview of USCIS Policy Memo Dated May 30, 2013 led by attorney Dawn Lurie of Sheppard Mullin with panelists David Hirson of Fragomen, Del Rey, Bernsen and Loewy, LLP, Henry Liebman of American Life, Inc and Mark Ivener of Ivener & Fullmer LLP. The group discussed the recent USCIS Guidance Memo and its ramifications on the EB-5 program including relaxed restrictions on Regional Center industry NAICS codes and geographical boundaries. The day ended with a post-conference cocktail hour by the beautiful Newport Bay where attendees, panelists, and sponsors enjoyed networking opportunities. Don’t worry if you missed the conference and your chance to interact with Congressman Goodlatte and these distinguished panelists. Congressman Goodlatte has been invited to return to EB5Investors.com’s Southern California EB-5 conference to provide an update on the Immigrant Investor Program from Capitol Hill. Thanks again to the participating Congress Hosts, sponsors, panelists, and attendees for making the second annual Southern California EB-5 Conference a success!